Wheels pitches 10 of the biggest sellers in the medium-to-large car segment to see which is the best of the current crop. 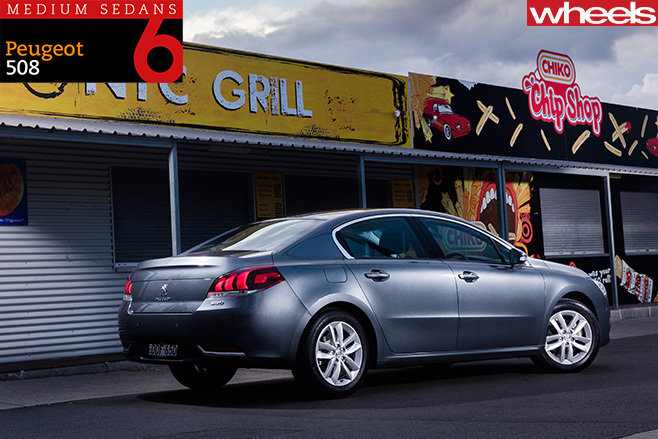 Here’s number 6, the Peugeot 508. 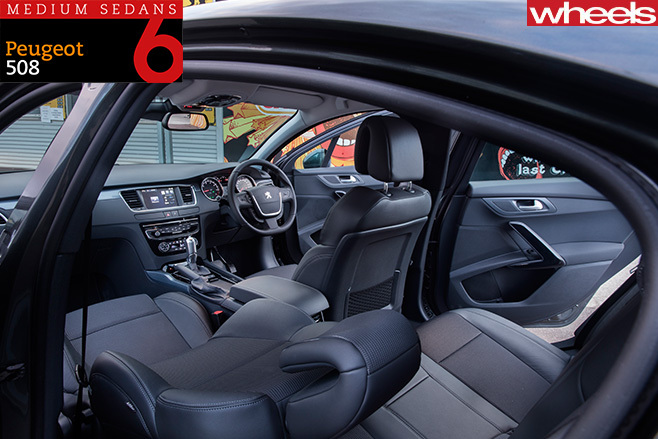 SINCE its 2011 launch, we – as in Wheels, new-car buyers and basically the world at large – have been largely apathetic about the Peugeot 508. An oddly Germanic French mid-sizer, with an allure more Angela (Merkel) than Angelina (Jolie), the 508 lacks the timeless prettiness and dynamic proficiency of, say, the 406 of the ’90s. This is a largely forgotten car. But has the world been too hard on the hapless Peugeot? Or has the 508 improved with age? The oldest of this group by some margin, a 2014 update brought a squarer jaw, cleaner console graphics, more kit and improved powertrains. And the result is a car with plenty of plus points and impressively few flaws. Let’s begin with the cabin, which happily seems larger than the Pug’s pert exterior dimensions suggest. Elegant, yet completely non-ostentatious, and with an appealing simplicity, what the dash lacks in pizzazz it makes up for in practicality. Firm, supportive front seats, an excellent driving position, attractively legible dials, effective ventilation and sufficient storage all suggest Hermann rather than Henri was in charge of layout. Yet delightful details abound: the Saab-esque retractable cupholders (just below the vents, helping to keep beverages hot or cold as required); a beautifully simple head-up display; rear-window blind; proper rear-door handgrips; and contrasting cabin materials that could have come from a Norman Foster workspace. Somehow, especially after the showy Koreans, the 508’s overall ambience is akin to the timeless grey flannel suit Cary Grant wore in Hitchcock’s North By Northwest. A useably large boot is the cherry on top. Annoyances? The relatively narrow body means the rear seat is tight for a trio of adults; ratchet rather than superior infinite front-seat backrest adjustment is rare in a Euro; and a few squeaks occasionally reared their unwelcome heads. But the interior is quieter than most of the others here, adding to our newfound affection. Part of that is due to the smooth, sweet, and quiet engine. 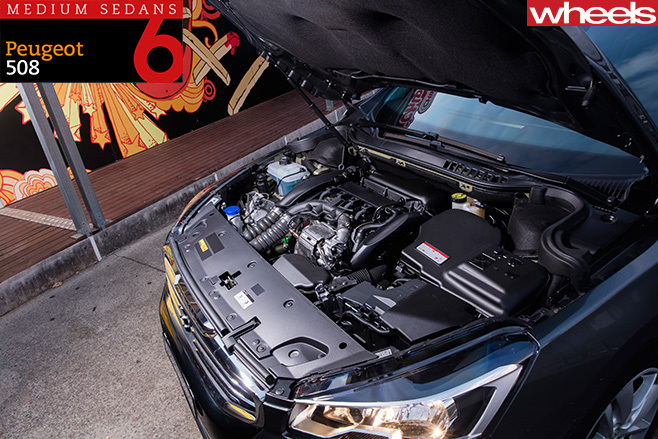 Small at just 1.6 litres, it nevertheless makes the most of the available 121kW/240Nm, stepping off the line with lusty intent and pulling strongly through the mid-range; to 40km/h it’s only 0.2sec shy of the searing Skoda Superb. Comparatively low weight and sensible gearing from the newly minted six-speed auto must take some credit, since the 508 never feels sluggish, except when steep hills or off-boost turbo lag slow things down. Better still is exceptionally low fuel consumption, beaten only by the VW Group teetotallers. Peugeot is serious about regaining the high ground. Fluid steering further adds enjoyment, providing informative and involving handling, especially as speeds increase, when the chassis and brakes gel together best. However, despite the ride being generally comfy and contained, it can err on the firm side, and that’s one of the less-desirable characteristics Peugeots have acquired this millennium. There’s also a tendency for the front-end to kiss its bump stops over fast, undulating roads. Regular readers will know how enthusiastically we rate the latest 308, but the 508 lacks its sibling’s superb suppleness, polish, and panache. Here, more than anywhere, is where age is taking a toll. Still, look past the 508’s confused identity and sombre design and you’ll find a stoic, solid performer of pleasing consistency and depth. The time has arrived to finally reconsider a mid-size Peugeot.